Edmonton mortgage rates are heavily influenced by ATB, Servus Credit Union and mortgage brokers. These are the lowest rates from providers with offices in or near the city. For providers outside of Edmonton check the best rates in Alberta. 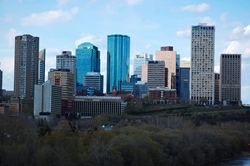 City in Brief: Edmonton is Alberta‘s second largest city and is unique among the Americas as the northernmost city with a population of more than one million. The city serves as a base for large-scale oil sands projects in the northern part of the province, along with diamond mining in the Northwest Territories. The city is perhaps best known for its sprawling West Edmonton Mall, the largest in North America, and world’s largest from 1981 to 2004.